I am going to sleep Under - the - stars to support Baale Mane girls and to help them lead a self sustainable life. Please support me to provide education for the Baale girls. 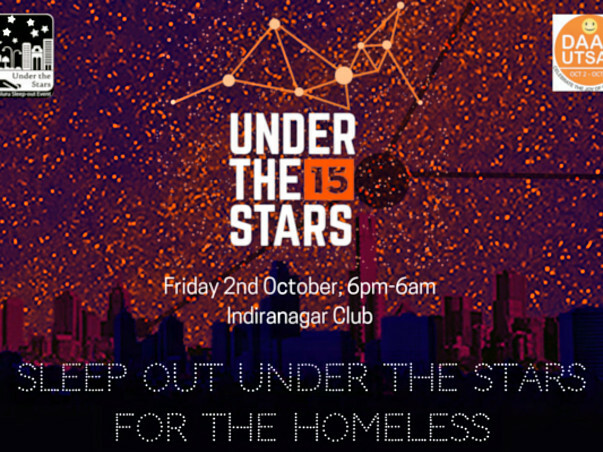 Under The Stars is a one of a kind fundraising event in India inviting 2,000 individuals to sleep out without shelter for one night. Participants register for a pass by making a donation of Rs. 900 ( students – Rs 700) to our partner NGOs. The event will mark the beginning of the Daan Utsav festival (earlier called Joy of Giving Week) celebrated from Oct 2-8 across the country. 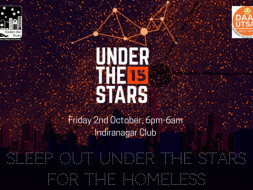 The event is to take place at the Indiranagar club on the night of October 2nd. All donations will go to Baale Mane Trust. The Baale Mane (Baale Mane means “Girls’ home”) at Gopalapura is a home situated on the outskirts of the city of Bangalore, India, for around 60 girls between the ages of 6 and 18 . We welcome and support girls of all faiths and we do not discriminate on the grounds of caste or creed. The home provides shelter and a loving home for girls. Some are orphans or have a single parent who is unable to care for them, and many have been rescued from domestic service. Others have been found homeless in the streets by volunteers or have been given shelter having been arrested by the police when living on the streets. Where possible, the aim of our home is to reunite the girls with their family but where this is neither possible nor desirable, the girls are given long term care and protection at the Baale. Our ambition is to nurture and resource the girls for a self-sustaining adult life. Thank you for your efforts ! Take care of your health.